At Knightdale Computer Repair, we offer quality on site computer service that does not cost an arm and a leg. All of our work is guaranteed for a minimum of 30 days and backed by over 15 years of experience in the Computer Industry. Our focus is not only on fixing your computer right the first time, but also keeping the problem from happening again. So, unlike other computer repair shops, we will not only fix your computer, but tune it up and provide preventative maintenance. We offer residential services, such as laptop repair, virus removal and hardware upgrades, as well as commercial services for any size business, including Custom Application Development, Web Design, Search Engine Optimization, and Pay Per Click management. Both on-site and remote support is available. 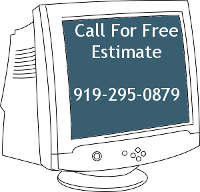 We service the Triangle Area, including Raleigh, Cary, Apex, Holly Springs, Knightdale, Clayton, Wendell, Garner, Zebulon, Fuquay Varina, and more.